We spent the weekend at one of our largest spring chores, trimming back the trumpet vine that surrounds part of our house. It requires a very high ladder, various shears, and patience. Planted just after the end of WWII, the vine provides an entire ecosystem on our south-facing wall. Birds’ nests, lizards, ants, various other insects I don’t care to think about but which leave me alone, even a beehive at the very top which we can never bring ourselves to remove because, well, the bees don’t bother us and they seem so happy there. 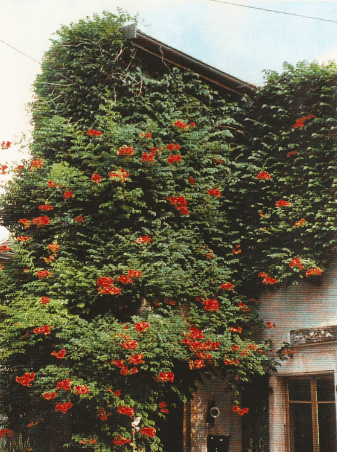 The trumpet vine, left untrimmed (as it was when we bought the house many years ago), will climb right up and lift the tiles off the roof. Pruned, it provides shade to the front entryway and a waterfall of flowers. The dried vines make for some of the best fire kindling I’ve ever used. Today, in celebration of the beginning of spring and the completion of the annual vine tending, I decided we needed to have an Indulgent Brunch. Two of the main components will be one of my top ten favorite cheeses, Brillat Savarin, and paired with that, some champagne. A half-round of triple-creme Brillat Savarin instantly classifies any meal or snack as indulgent, and not just because it has a fat content of 75%. It has a delicate mushroom flavor mixed with buttercream, and a snowy edible rind. Invented in the 1930s and produced year-round in Normandy and Burgundy, it was named for famed 18th century gastronome, Jean Anthelme Brillat-Savarin – who just happened to be born in Belley, a little over an hour from our house (by car, of course). He wrote The Physiology of Taste (1825), and led a life of various ups and downs, fortune and loss, that saw him exalted in France, exiled in Switzerland and living from violin lessons in America (although not necessarily in that order). We have friends visiting from out of the country, and I asked them what they would like to have. Cheese, they said, lots of cheese. So, an indulgent brunch of cheese it is, starting with the luscious Brillat Savarin. As Brillat Savarin said, “The senses are the organs by which man places himself in connexion with exterior objects.” We will be doing just that – placing ourselves in connection with cheese, champagne, fresh spring strawberries and best of all, friends. I enjoyed your post, PK. And what a strange looking plant… capable of supporting an ecosystem too! Do you think that it would grow in Brittany? I think it would probably grow in Brittany – it survives our cold mountain winters and hot (+37°C) summers. It is a rampant grower – and it leaves a vine of large hanging pods the size of a mid-length knife every fall. It’s so dense that we can hear a flock of birds in it every year – but they remain invisible. Hmm, that definitely sounds interesting… I shall investigate further!